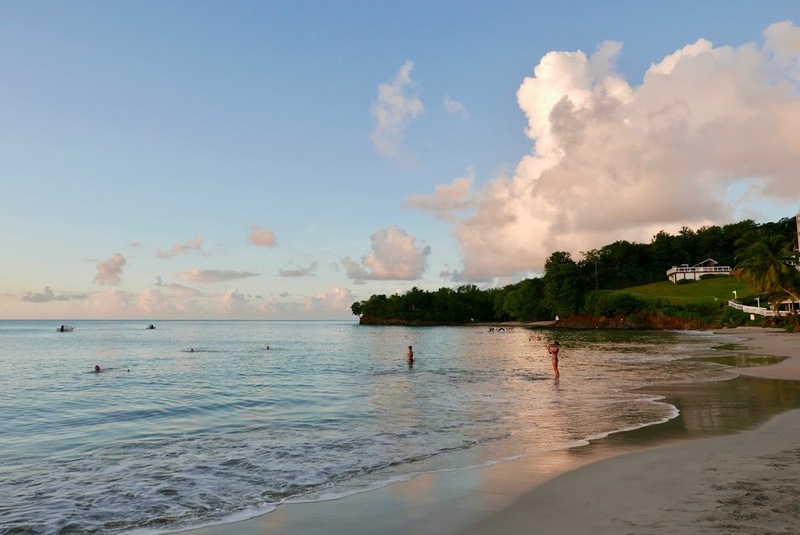 I went away to St Lucia last November, and had the most amazing nine days in the sun. 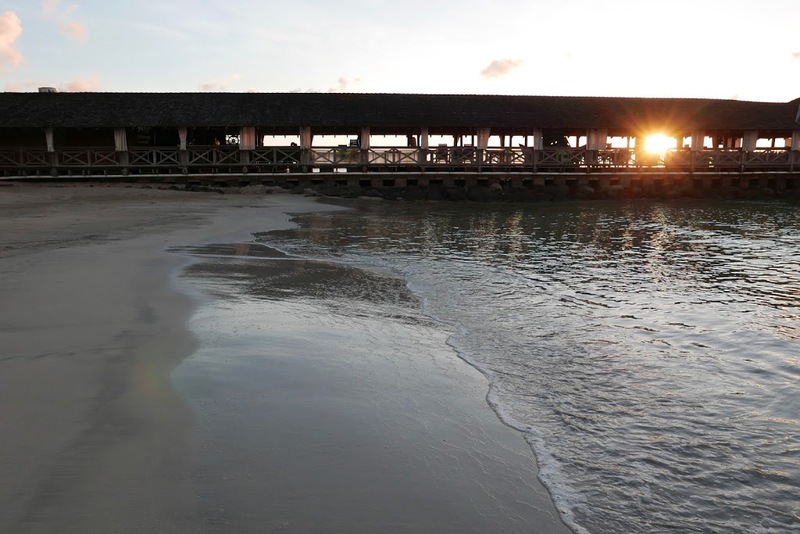 We stayed at St James’s Club, Morgan Bay which was part of an all-inclusive package deal through Virgin. 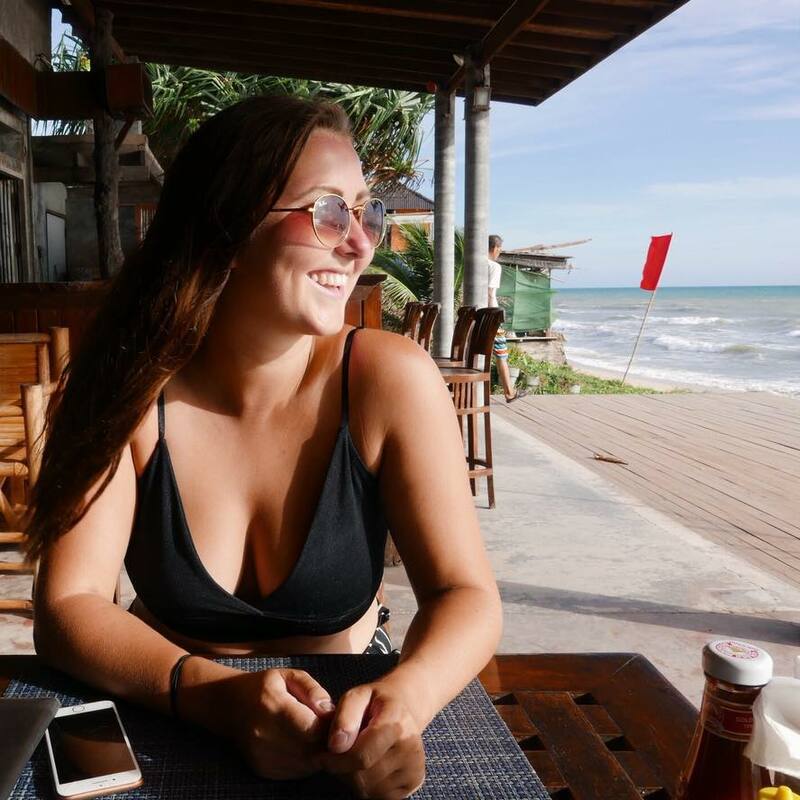 Even though we stayed all-inclusive, we still ventured out of the beautiful hotel on adventures, and I like to think we made the most of our time there! 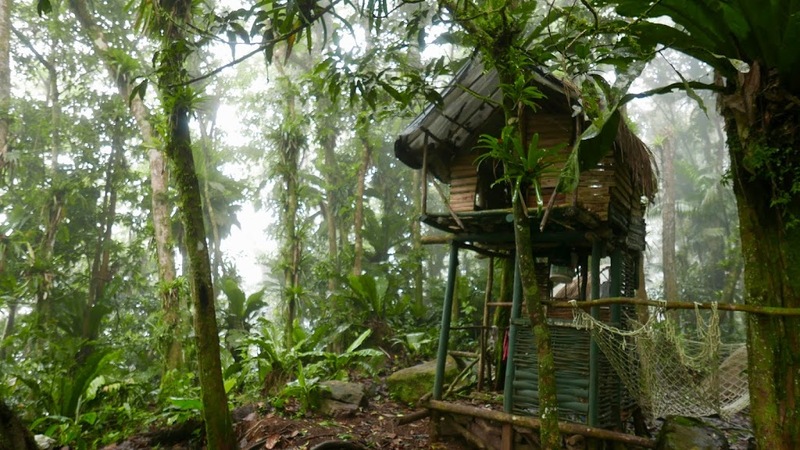 It was the perfect balance of relaxing and exploring. I’ve put together a list of 10 things that you should definitely do if visiting this wonderful island – some are obvious but others may not be! I hope this could be useful to anyone who is planning on heading to St Lucia. Firstly, I’m just gonna put it out there. You can’t go to the Carribean and not wake up in the morning wishing you hadn’t drunk all that rum the night before. I like to think it’s appreciating the culture? But honestly – make sure to eat (not only drink) something local whilst you’re out there. We did a couple of day trips with Joy’s Tours in which we were treated to lunch, and it was incredible! I mean, any lunch where I’m offered macaroni cheese pie & mash together is a winner for me. But the authentic BBQ chicken and plantain and everything is something you must try. 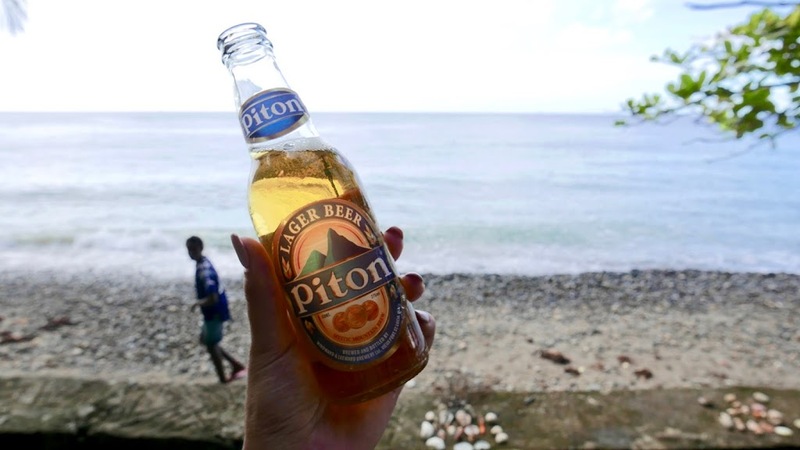 And yeah, it washes down nicely with some rum punch or Piton beer! Who doesn’t love to get covered in mud?! The Sulphur Springs pride themselves in being the only ‘drive-in’ volcano in the world – which is a pretty impressive feat! 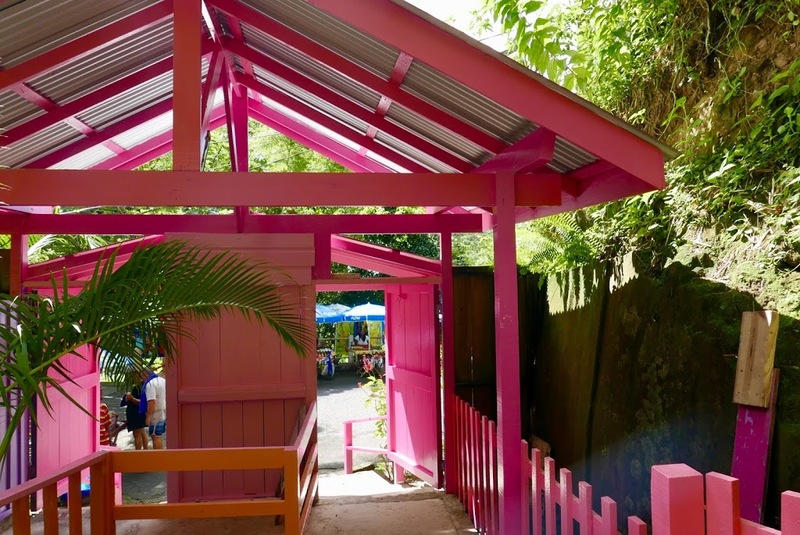 You’ll find them in the Soufriere Volcano, and don’t worry – it hasn’t erupted since the 1700s and is considered dormant. The mud bath means you can jump in and submerse your whole body in mud, allowing it to work wonders on your skin (or so they say!). The mud dries a light colour, but they have a darker mud you can dip your hands in to draw on each other with for photographs! This is definitely somewhere to take your camera, as we all looked pretty funny. You then wash what you can of it off in some water – they advise wearing a dark swimsuit so that the mud doesn’t stain. I had to take my jewelry off when I got there and leave it on a bench, so I’d advise leaving jewelry behind before you make the trip! 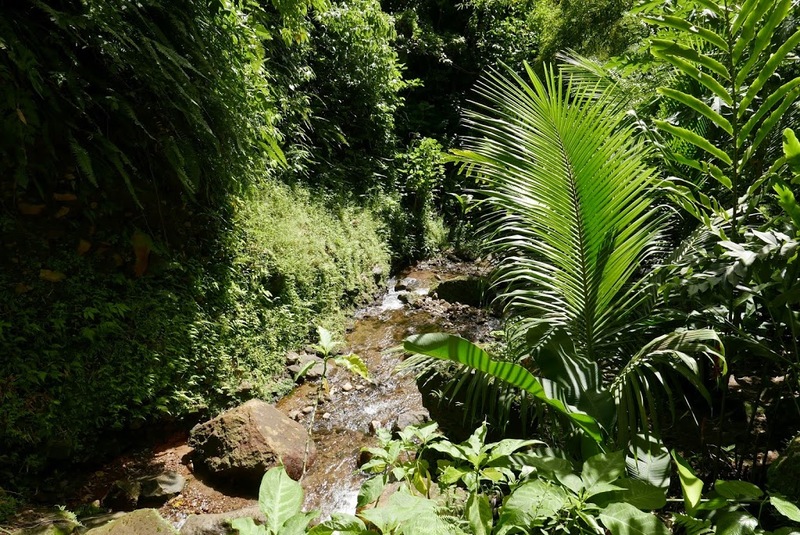 We went here after going to the mud baths, as it’s still in Soufriere. This was the perfect place to go after the mud baths, as we got to shower off any remaining mud in the most incredible waterfall. 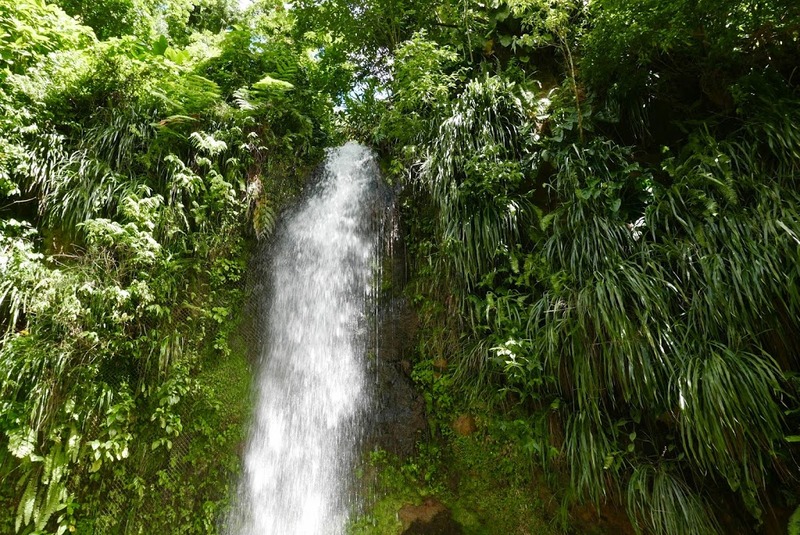 It is around 8 meters high, and is definitely refreshing – the water here is not warm..! 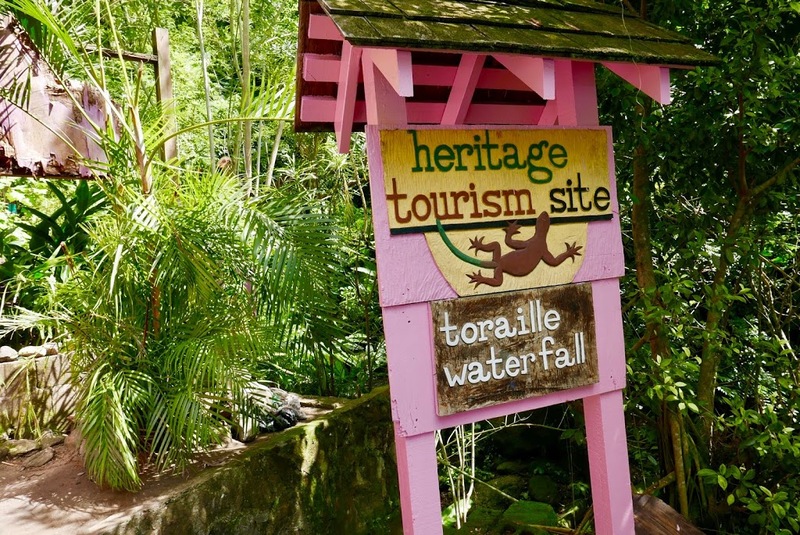 The waterfall is still worth seeing even if you don’t decide to go for a dip, as it is surrounded by beautiful botanical gardens and brightly colored buildings and fencing. As soon as you get to Sugar Beach you’ll understand why it has its name. 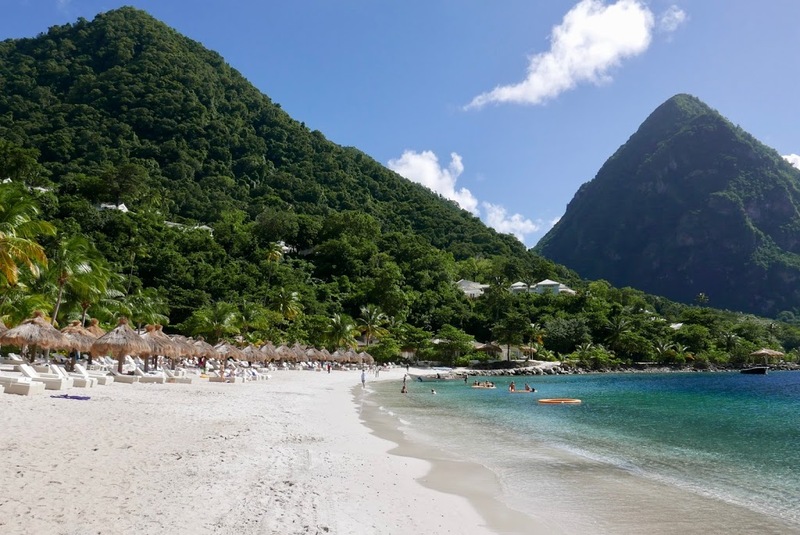 As St. Lucia is a volcanic island, it doesn’t naturally have the white sand beaches that a lot of the rest of the Carribean islands have. Therefore, a lot of the tourist beaches have sand that is imported, as naturally the sand would be black! 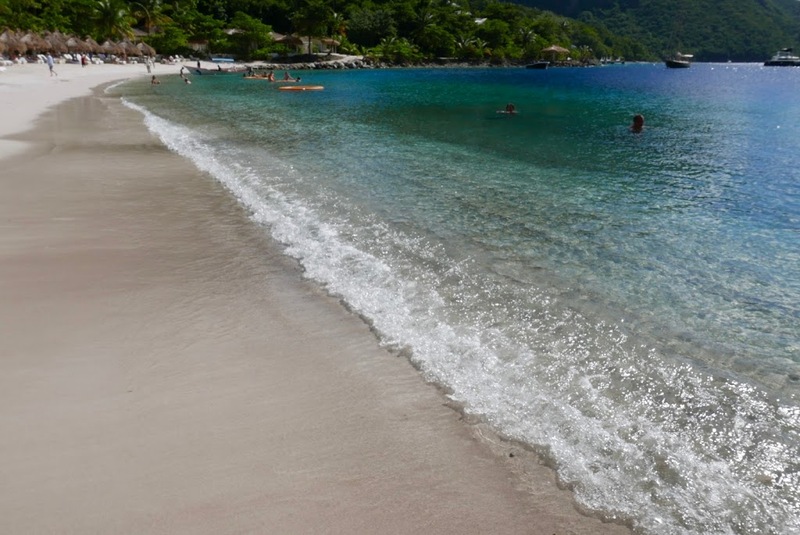 Sugar Beach is quite the opposite, with the imported sand genuinely looking like sugar – meaning the water here is a beautiful crystal blue. 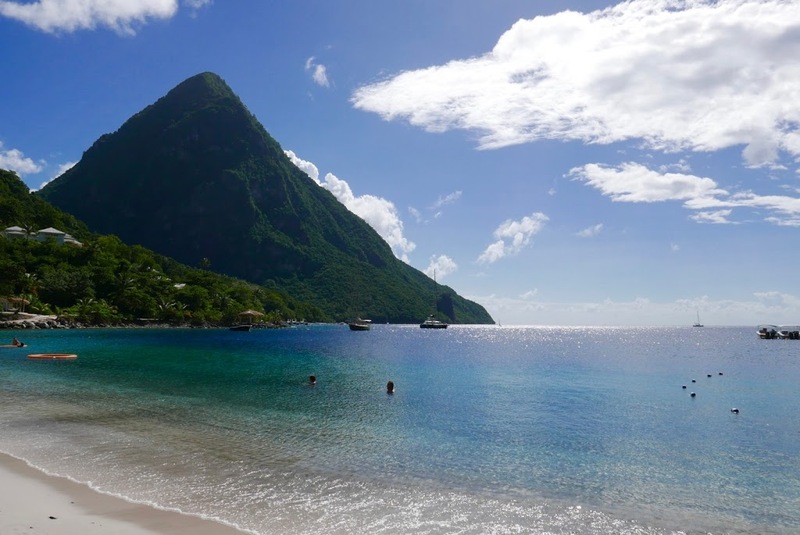 The beach is also situated next to the Pitons, meaning it’s got a great backdrop. On one side of the beach is a snorkeling area, with lots of different fish to see! You have to be careful as the floor is mostly covered in fire coral, so once you’re swimming, don’t stand up! 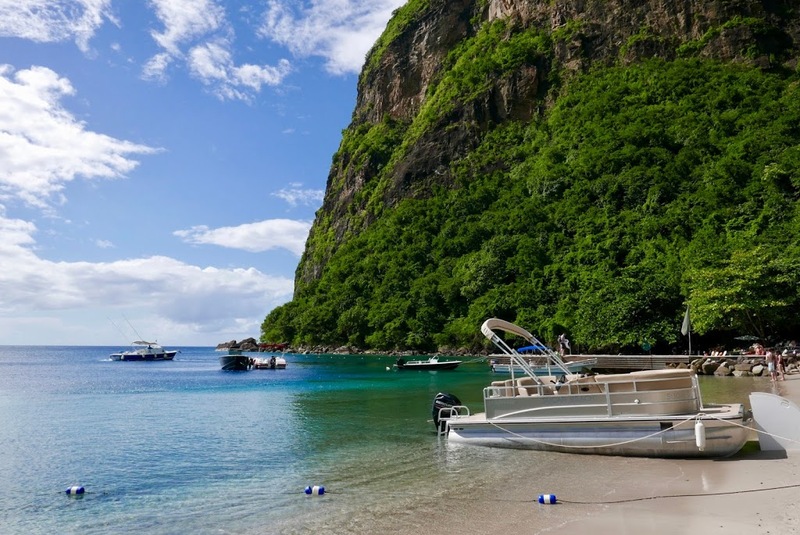 We went here to snorkel and just hang out on one of our day tours, and it really is worth visiting as it’s so beautiful. 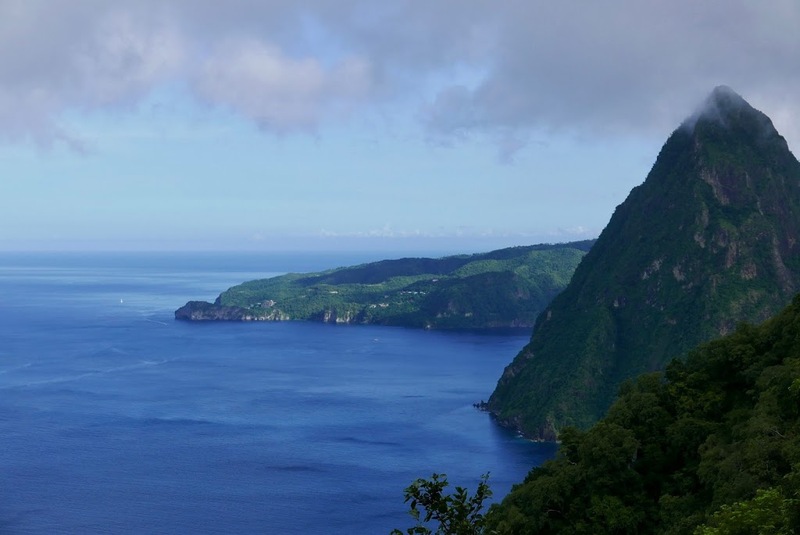 Obviously one of the main tourist sites for St. Lucia is the Pitons, which you see in so many postcards and photos. 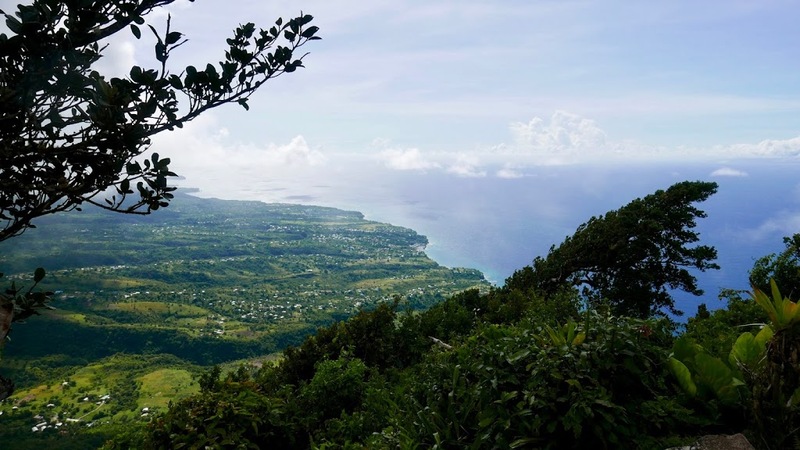 They’re an amazing site from sea level, but it’s even better to climb to the top of the larger of the two, Gros Piton! I don’t say this lightly, as it wasn’t exactly the relaxing day we’d thought this holiday would be full of. 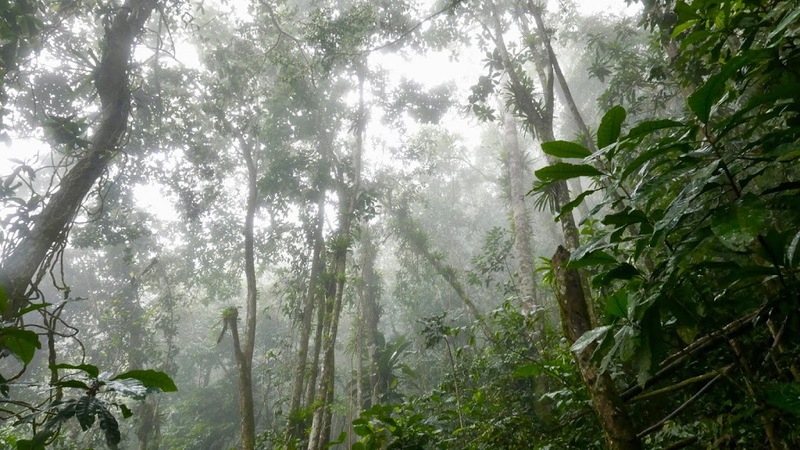 The climb up is partly path, but it involves quite steep climbing at points and as we got higher the humidity meant it was really slippery. Which was even worse on the way back down! I don’t think we fully thought through what this was going to be – I had in mind a nice little walk! But the views from the top make it worth it. We were unlucky the day we went up had quite heavy cloud, so we didn’t really get much of a look down apart from when there were gaps in the cloud. The climb took a few hours up and down, and afterwards we all got ice cream from the hut at the bottom – which was very well deserved! We had a tour guide take us up and you stop at every quarter, where there are viewing platforms to take a look at your surroundings. It was a really incredible morning and something you should definitely give a try if you have the chance! Most hotels offer packages to go out and do this, but you’ll get a cheaper rate from one of the local tour companies – we did everything with Joy’s Tours which were brilliant. On a Friday night, there is no place you should be other than the Gros Islet street party. Held every Friday, this is a highlight of the week for locals, with the streets becoming a buzz with loud Carribean music, people dancing and drinking and amazing food! We’d heard from friends that we should go, and then got chatting to the staff in our hotel who said that they were all heading there after work. We went as four girls and sticking together we didn’t feel unsafe at all – the locals were all very friendly. We drank rum and had a dance, though we definitely stood out from the crowd as the awkward English people… the locals really know how to dance! After this we headed home with some chicken in hand, which cost hardly anything from a little BBQ on the street. This isn’t something I’d usually be awake to see, but I didn’t quite let my body get used to the 4 hour time difference so I found myself waking up to see it a couple times. It was truly beautiful, especially when it’s so early that no one else is around and the beach is silent. 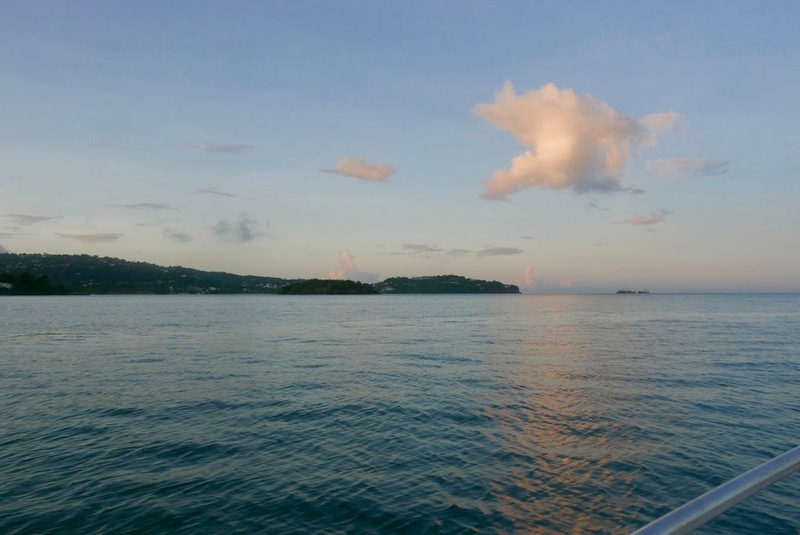 When we climbed Gros Piton we met at the beach at sunrise to get in the boat, meaning we watched the sun come up as we went across the water. This was also something really special, and definitely made the early morning worth it. I think this one goes without saying! 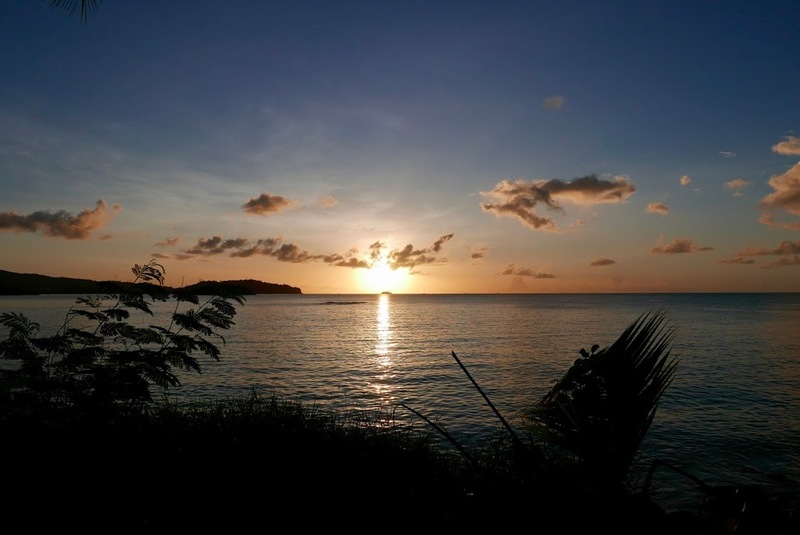 Of all the places I’ve traveled, I think that Carribean sunsets are the most incredible. The sky is so full of color, and reflected in such clear waters – it’s truly magical. Whether viewing it from the beach or from up on a cliff, sunset was always my favorite time of the day. 9. Go out on a boat! 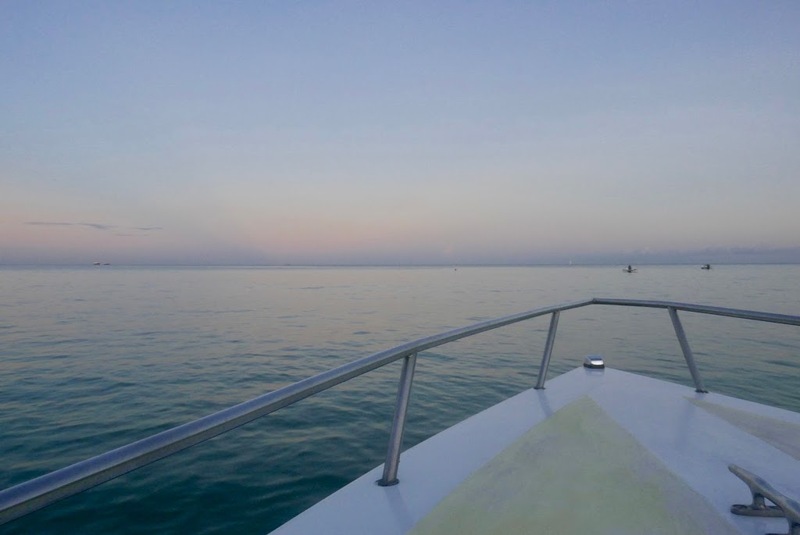 With the seas so blue and clear, a boat ride is a must. 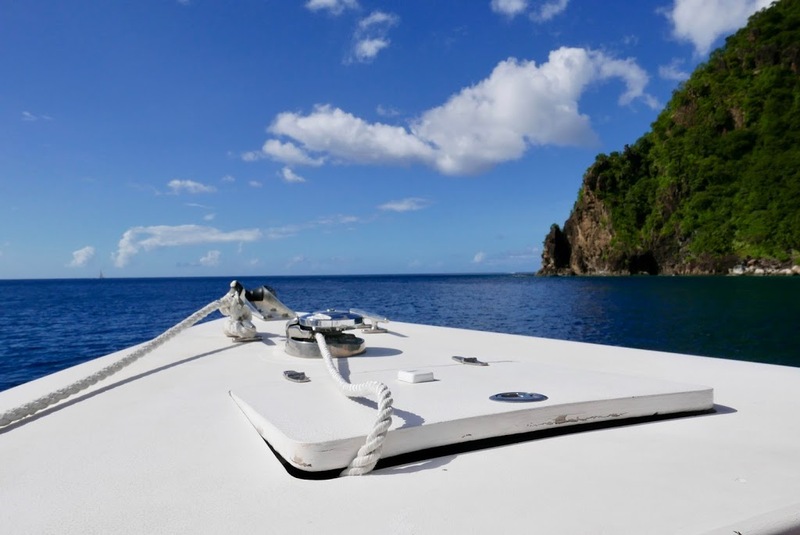 We got a boat for our day trips, as it was a half an hour boat journey down to the Pitons rather than a much longer car journey. These were always amazing – there’s something about having the wind in your face and being able to taste the salt in the air. You also get to see the most amazing views of the island! They’re even better when they decide to play some Bob Marley on the speakers and pass around the rum punch! Though, this made getting out the boat at the other end a bit difficult! We were lucky that our hotel included a lot of different watersports as part of the all-inclusive, but I think most places out there offer something. The sea was really calm where we were so my favorite was paddle-boarding, though we had a lot of fun on the banana boat too! The water is so beautifully clear and warm, make the most of it – watersports are a lot more enjoyable when it’s not absolutely freezing to fall in! 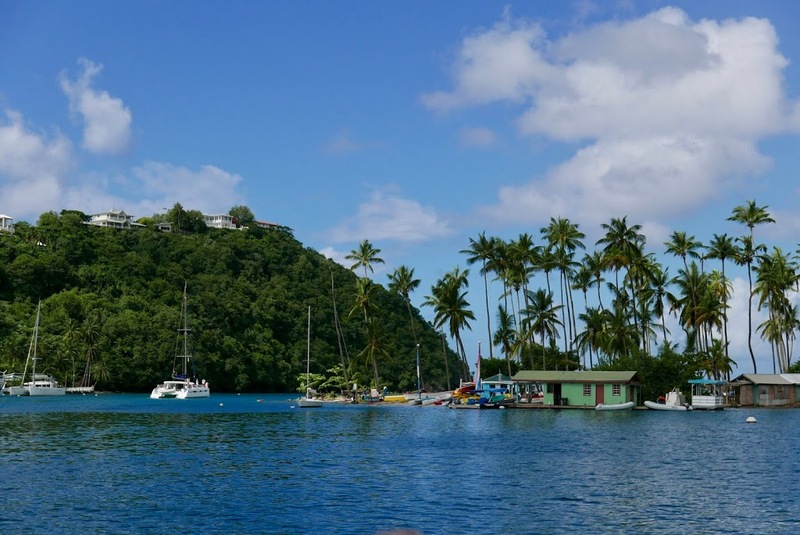 I hope that you’ve enjoyed reading this, and anyone else who’s been to St Lucia agrees with what I’ve had to say! If you’re heading there any time soon I’d love to hear what you think, and if I’ve missed anything out! 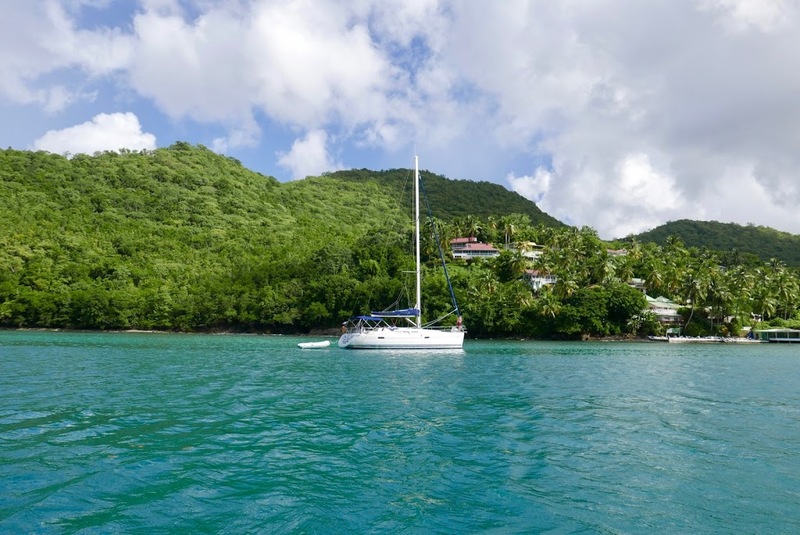 The only other thing I wish I could put on my list was a helicopter ride, where you can see the whole island – but this was a little out my budget! Hi! I’m Charlotte. I’m 23 years old and I live in Bristol, UK, but I’m usually somewhere else in the country/world! I’m originally from Cornwall and still do work down there, so you can often find me there by the sea. I’ve always enjoyed writing, and I started to feel like I should be writing about all the amazing places I’ve been lucky enough to visit. I’ve also always loved taking photos, and I quite often find myself with so many photos and nowhere to put them. So writing about my adventures to go alongside these photos is something I’m really enjoying doing. You can find my work on my blog “Charlotte Rick”.